Kuala Kangsar is a royal town in Perak where the Sultans of Perak officially have been residing since the 18th century. It is a quite small place with just 39000 inhabitants. Its main attraction is the Ubudiah mosque, probably the most beautiful mosque in Malaysia. 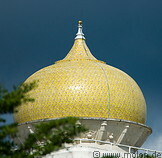 The mosque was completed in Moorish style in 1917 and has golden domes. Near the mosque lies the Istana Iskandariah, the royal palace of the sultans of Perak. 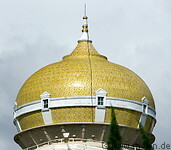 Istana Iskandariah was completed in 1933 and has onion shaped golden domes. Adjacent to the palace is the Royal Perak Museum (Muzium Diraja Perak), built in 1926 in Moorish architecture.